Perfect as a drawer and closet freshener. Pour into a bowl to add a lovely scent to any room. Tuck a small bag of lavender under your pillow for a night of sound sleep or toss one into the dryer to add a pleasing and insect-repelling scent to your clothes. 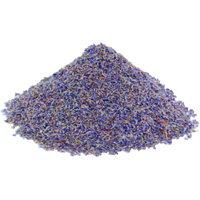 A full half pound of our very best dried French Lavender flowers in a resealable bag.